The 'Badtameez Dil' singer Benny Dayal gets married to model-actress girlfriend Catherine Thangam on Sunday, June 5. It was a private affair with just family and close friends. 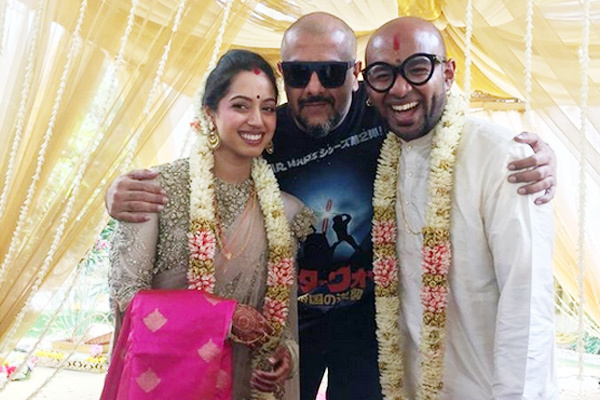 This big and happy news came to light when, Bollywood composer and his close friend Vishal Dadlani took to Twitter and posted saying: "You guys are beautiful, Benny Dayal and Catherine Thangam! Much love and joy, always!" In the pic you can see, the couple with utmost happiness and garlands around their necks. Benny is seen wearing a white kurta while Catherine is beautiful in a pastel coloured sari. To this singer, Benny retweeted Dadlani's post. Sources say that, Benny met Catherine through a common friend and from then on they hv been dating for quite some time. During the marriage on Sunday, the couple followed both Hindu and Christian rituals. There are reports that reception will be held in Kerala soon. Singers Mika Singh took to twitter and said, "Congrats bro. Benny Dayal and dear Catherine Thangam wishing you both a happy married life... While Salim Merchant also wished the couple on micro-blogging website, he said: "Best wishes and lots of love to the newly married couple Benny Dayal and dear Catherine". Benny has sung songs for movies like 'Thalaivaa', 'Delhi-6', 'Ladies vs Ricky Bahl', 'Cocktail', '2 States', 'Hasee Toh Phasee' and 'Bang Bang'.